Voles are some of the smallest species of underground rodents and are often mistaken for chipmunks or moles because they will take up residence in the homes that squirrels and chipmunks leave behind. Voles are extremely small; rarely growing longer than a few inches and have a variety of coat colors, but are usually grey or brown. They feast on plants, tree bark, vegetables and fruit or anything that is eatable. Voles are attracted to the places where food in plentiful, such as urban and rural yards because people water their lawns, so the voles will leave the dry plains after spring to find a lush backyard to make their home. They dig their tunnels just under the surface of the ground or they will take up residence in abandoned mole or ground squirrel tunnels. Voles present a very big problem for the gardener and the landscaper. Not only do they make the existing tunnels of moles and ground squirrels worse, but they start their own tunnels that can really damage your lawn. You can tell that you have vole issues when you see tunnels that resemble tree branches or road maps stamped into the soil. You can also tell that its voles when all the grass dies around the tunnels and the holes that they leave. Voles will devour any of the plant roots, flowers, grass, trees, etc. that happens to cross its path. They will make your lawn really ugly and destroy the valuable food in your garden. If you are having problems with voles, here is what you should do. Vole poisons are the most effective way to get rid of the vole population. These poisons can be placed near their favorite places or the entrances to their tunnels. However, be aware that poison is a dangerous way to go because your family pet or wild animal can get a hold of the poison and die or they can eat a poisoned vole and get poisoned indirectly. You can pick up these poisons online, in hardware stores and in some garden stores. You could try to trap a vole, but this is not very effective. The reason why traps are not effective for voles is that they are very small, so the trap has to be very sensitive. Also, voles populate an area very quickly (a female vole with produce almost 70 young a year) and there is no way to trap all of them. Not to mention that it is very time consuming, you must check the traps everyday and you also have to relocate them once you have caught them. Releasing predators is also an effective way to get rid of voles. Releasing a few non-venomous snakes will do the trick. A snake can clear almost an entire acre in a few months and will then leave your property when the food is gone. Having outdoor cats can also control the vole population as well as having owls and hawks. While you cannot purposely put an owl on your property, you can attract owls to your land by putting up nesting boxes. If all else fails, or if you don’t want to deal with the hassle of getting rid of voles yourself, you can call a pest removal service. These professional know how to get rid of these little critters and have the patience and the tools to do it. Not only can they do it quickly, but they can get rid of your vole problem in a way that is safe to you and the animal. While this is expensive, it is worth it knowing that the issue is being handled correctly. 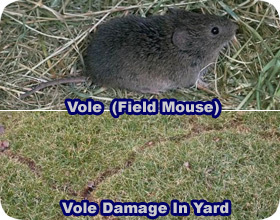 Go back to the main Vole Removal page for more information about how to get rid of vole.